What is Curcumin Complex For Pets? Curcumin Complex for Dogs and Cats can give your pet fast pain relief. Curcumin Complex for Pets is a powerful anti-inflammatory that is backed by extensive research. Great for cats and dogs. Easy to administer and economical. Curcumin Complex For Pets is a patented, unique composition of three bioactive, health-promoting curcuminoids: Curcumin, Bisdemethoxy curcumin, and Demethoxy curcumin. These are the strongest, most protective, and best-researched constituents of the herb turmeric. Multiple studies show that this scientifically-extracted combination not only scavenges and neutralizes harmful existing free radicals; it also prevents their formation in the first place. These interactive antioxidants are proven to protect and strengthen vulnerable organs such as the colon, liver and heart. In addition, these standardized substances give your pet's body powerful, natural tools to better control and diminish systemic inflammation. Curcumin (turmeric) shows excellent safety in clinical studies. Curcumin has been demonstrated to be safe in many human trials and has demonstrated anti-inflammatory activity. Excessive inflammation is a common risk factor for disease occurrence and progression. Inflammation may lead to lack of mobility, pain, achiness, joint stiffness, cancer, brain degenerative conditions and other pet health issues. Curcumin has been helpful for pets to reduce inflammation, whether acute or chronic, caused by physical injury, joint wear and tear (as in osteoarthritis) and inflammatory conditions such as hip or elbow dysplasia. Curcumin Complex for pets is especially bioavailable (pets can get the most benefit), because Sunflower Lecithin acts as an emulisfier to improve absorption. This is why Curcumin Complex For Pets is more beneficial for pets than just sprinkling turmeric spice on your pet's food. The C3 Curcumin absorbs best when digested with fat, especially Omega 3 fatty acids such as Amazing Omegas. Dogs And Cats With Mobility Concerns Curcumin helps pets that are slowing down, having difficulty getting up, showing signs of stiffness or joint pain. Curcumin reduces inflammation, helps relieve pain and improves mobility. For best results, use the Joint Support Kit which contains Curcumin Complex for Pets, ArthroSoothe and Amazing Omegas. Curcumin Complex For Pets has helped dogs with hip and elbow dysplasia, torn ACL ligaments and injuries. Dogs And Cats With Cancer Curcumin is essential for dogs and cats with cancer as it supports a healthy immune response, has cancer-fighting properties and is a critical antioxidant. Curcumin can reduce oxidative damage from free radicals and may help inhibit cancer tumor growth. This product does not contain wheat, yeast, soy protein, gluten, eggs, dairy,corn, artificial colors, flavors, sugars, or preservatives. Made With Non-GMO Ingredients. Made in the USA. “Right now all of our pets are doing really well. They're happy and full of energy with shiny coats which I totally attribute to your nutrition guidance - good foods and supplements. My dogs use several of your products: Kayla (Belgium shepherd) has a sensitive stomach so I give her K9 Digestive Enzymes and Power Probiotic. Ben (Golden retriever-10 yrs old) has a bad hip from an accident when he was a puppy so he takes Amazing ArthoSoothe and Curcumin Complex. Molly (Schnauzer-12 yrs old) has skin issues so she gets Power Probiotic and K9 Yeast Defense . Obviously, as you can see, we are very satisfied Ask Ariel customers!" "Tango continues to be completely PAIN FREE while on Curcumin, Arthrosoothe and Amazing Omegas without any episodes of nerve pain. Thank you so much, Susan!!!" "Willow had her follow up scan and bloodwork today......4 months after surgery and diagnosis. I’m so overwhelmed with gratitude and emotion I couldn’t wait to email you. Her ALT level is normal! Her ALKP is barely elevated! Most importantly......the growth that was on the underside of the liver that was inoperable, is gone!!!!! They did multiple scans in all different ways trying to find the tumor and it’s not there. They looked at everything on her and nothing. Everything is perfectly normal and healthy and the doctors said that if they didn’t know the history they would have questioned why they were even examining her. She acts like a puppy and is so happy and energetic we almost can’t believe it. Thank you, thank you, thank you! You are an absolute angel from God." "Our dog Bleu is 8 years old and very active. Recently, we noticed he was really slowing down, seemed stiff and overall less agile. He stopped jumping on our bed and seemed to be much less spry. He also had an episode where he was crying out about his neck following a day of playing with his friends. We gave Bleu Amazing Arthrosoothe and noticed improvement within a few days (He already was using the Amazing Omegas which has helped his coat and allergies tremendously). But, then upon adding the Curcumin--wow--what a difference in energy. Our bouncy boy Bleu is back! We have heard similar stories about cats with inflamed, swollen limbs. We hope your pet will show the bounce and energy that we have experienced." Thank you for the amazing supplements you provide. We see a tremendous improvement in the lives of all our cats and dogs! They have more energy and are far healthier. Subsequently we spend a lot less time at the veterinary office. With your supplements we are looking forward to having our babies with us for many more years! The picture attached is of my Lab mix Julie. Just shy of her 3rd birthday, she was diagnosed with epilepsy. The day after the test came back we went online to email you guys about her condition. 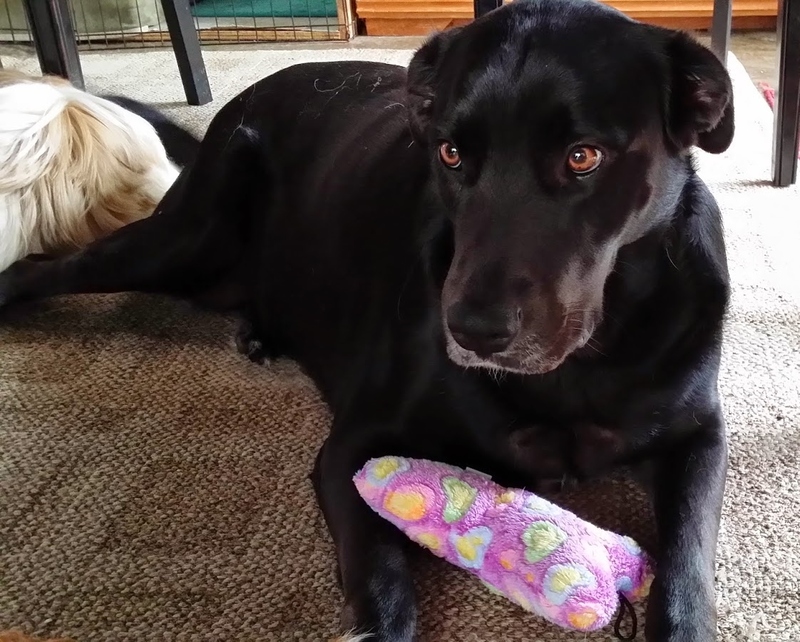 We bought everything that was recommended and a year later we've been seizure free and have seen a remarkable improvement in her attitude and energy She is taking her NeuroFlam, Dog Brain Booster, Purrfect Pet CoQ10, Curcumin, EFA oils, and probiotics daily. She is only 3 years old and is the sweetest girl! Thank you for giving me many more healthy years with her!"